I finally did it. I sent my Tamron lens in for service. This is my main walking around lens, and only wide-ish lens. So… for now I am walking around with the Nikon 50mm f/1.8. I like that lens, but it sure isn’t on the wide side. Ever since I got the lens there has been issues with the camera reporting a F–. That means that the camera body doesn’t think there is a lens attached. I had to return two other versions before this one too. The current copy doesn’t do it often at least. The front mount where the hood goes seems loose. It is very jiggly. I don’t remember it like that before. I don’t know if that effects any of the lens elements. Probably not. The biggest issue is focus. I have been disappointed since getting this lens with it’s sharpness. I think it deteriorates toward 50mm the most, and is most evident as smaller apertures like 2.8. When I try to take pictures of people at 2.8-4.0 the success rate of in focus shots is rediculously low. I lived with this stuff for awhile now, thinking that this is what I get for not going Nikon, but it isn’t acceptable now. I bought this lens after hearing from several Canon shooters who had the similar lens in a Canon mount just how good it was. I can’t believe it is the same lens they talk about. It was getting some quality Nikon glass that pushed me to send it in though. I now have a Nikon 70-200mm f/2.8, and that lens is amazing. It really does make me want to try other Nikon lenses out and see if they are as good. The Tamron is no where near as sharp a lens. 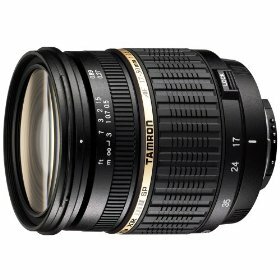 I can only hope that Tamron can find some little screws to adjust in there somewhere that will magicly make me like this lens. Otherwise, I am saving pennies (and lots of them) for the Real Deal. Update: I got a paper confimation (05/29/2009) that they had recieved the lens and found issues they would fix. Paper. Really? This entry was posted in Hardware, Photography and tagged 17-50, tamron by Chris Ward. Bookmark the permalink.